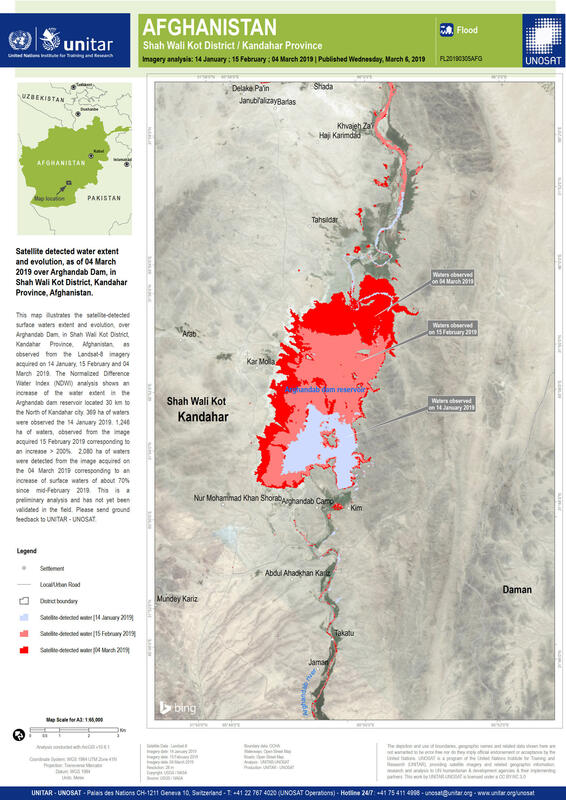 This map illustrates the satellite-detected surface waters extent and evolution, over Arghandab Dam, in Shah Wali Kot District, Kandahar Province, Afghanistan, as observed from the Landsat-8 imagery acquired on 14 January, 15 February and 04 March 2019. The Normalized Difference Water Index (NDWI) analysis shows an increase of the water extent in the Arghandab dam reservoir located 30 km to the North of Kandahar city. 369 ha of waters were observed the 14 January 2019. 1,246 ha of waters, observed from the image acquired 15 February 2019 corresponding to an increase &gt; 200%. 2,080 ha of waters were detected from the image acquired on the 04 March 2019 corresponding to an increase of surface waters of about 70% since mid-February 2019. This is a preliminary analysis and has not yet been validated in the field. Please send ground feedback to UNITAR - UNOSAT.